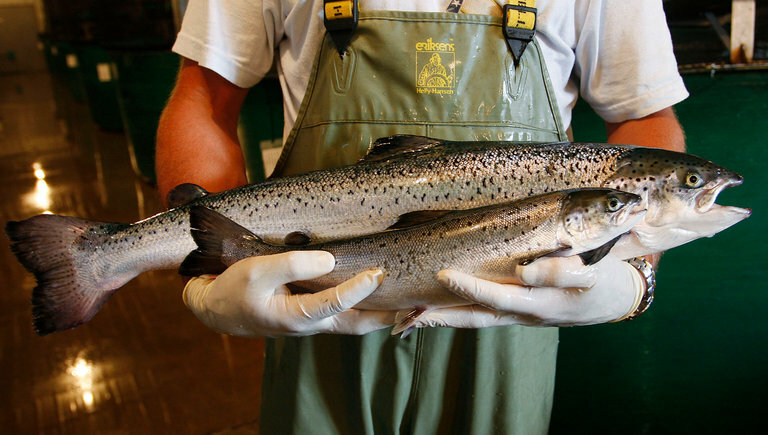 Federal regulators on Thursday approved a genetically engineered salmon as fit for consumption, making it the first genetically altered animal to be cleared for American supermarkets and dinner tables. The approval by the Food and Drug Administration caps a long struggle for AquaBounty Technologies, a small company that first approached the F.D.A. about approval in the 1990s. The agency made its initial determination that the fish would be safe to eat and for the environment more than five years ago. The approval of the salmon has been fiercely opposed by some consumer and environmental groups, which have argued that the safety studies were inadequate and that wild salmon populations might be affected if the engineered fish were to escape into the oceans and rivers. “This unfortunate, historic decision disregards the vast majority of consumers, many independent scientists, numerous members of Congress and salmon growers around the world, who have voiced strong opposition,” Wenonah Hauter, executive director of Food & Water Watch, said in a statement. The AquAdvantage salmon, as it is known, is an Atlantic salmon that has been genetically modified so that it grows to market size faster than a non-engineered farmed salmon, in as little as half the time. “The F.D.A. has thoroughly analyzed and evaluated the data and information submitted by AquaBounty regarding the AquAdvantage salmon and determined that they have met the regulatory requirements for approval, including that food from the fish is safe to eat,” Bernadette Dunham, director of the agency’s Center for Veterinary Medicine, said in a statement. F.D.A. officials said on Thursday that the process took so long because it was the first approval of its kind. People involved in the application suspect that the Obama administration delayed approval because it was wary of a political backlash. The officials said the fish would not have to be labeled as being genetically engineered, a policy consistent with its stance on foods made from genetically engineered crops. However, it issued draft guidance as to wording that companies could use to voluntarily label the salmon as genetically engineered or to label other salmon as not genetically engineered. Ronald Stotish, the chief executive of AquaBounty, which is majority-owned by Intrexon Corporation, said he was delighted and somewhat surprised by the approval after all this time. “We had no indication that approval was imminent,” he said in an interview. Mr. Stotish declined to say what the plans were for bringing the fish to market, other than that the salmon would not be in stores immediately because it would take about two years for even these fast-growing salmon to reach market size. It is also not likely there will be much of the salmon on the market because the approved production facility, which is in Panama, has the capacity to produce only about 100 tons of fish a year — a tiny amount compared with the more than 200,000 tons of Atlantic salmon the United States imports each year. Mr. Stotish said he did not know if approval was still needed from Panama to export the fish. The fish are supposed to be raised inland in contained tanks to lessen the chances that they will escape into the wild. AquaBounty and its supporters say this will also be less stressful on the environment than using pens in the ocean. And it could eventually allow the fish to be raised in the United States, rather than being imported, as most farmed Atlantic salmon is. For now, however, the fish are being raised in Panama, from eggs produced in Prince Edward Island, Canada. If the salmon were bred or raised elsewhere, for marketing to Americans, that would require separate approvals. However, moving beyond Canada and Panama seems to be the plan, according to a regulatory filing by AquaBounty a year ago. It said at that time that after winning F.D.A. approval it would look to build a hatchery in the United States and expand the one in Canada to sell more eggs to fish farmers, who would then grow the salmon to market size. AquaBounty said it might also grow salmon from the eggs itself. In addition to the United States, it said it eventually hoped to sell the salmon in Canada, Argentina, Brazil and China. The approval could help other efforts to develop genetically modified animals. Scientists and biotechnology industry executives have complained that the long, unexplained delay in approving the salmon was a deterrent to the field. Several other attempts to develop genetically engineered animals for consumption, like a pig whose manure would be less polluting, have fallen by the wayside. Now, however, there has been a surge of interest in developing new genetically altered farm animals and pets because new techniques, including one known as Crispr-Cas9, allow scientists to edit animal genomes rather than add genes from other species. That has made it far easier to create altered animals. Scientists in China, for instance, recently created goats with more muscle and longer hair. Researchers in Scotland used gene editing to create pigs resistant to African swine fever. It is not yet clear whether animals created this way would fall under F.D.A. regulation. The AquAdvantage salmon contains a growth hormone gene from the Chinook salmon and a genetic switch from the ocean pout, an eel-like creature, that keeps the transplanted gene continuously active, whereas the salmon’s own growth hormone gene is active only parts of the year. The company has said the fish can grow to market weight in 18 to 20 months, compared with 28 to 36 months for conventionally farmed salmon. Opponents of the fish say that if the bigger fish were to escape, they could outcompete wild salmon for food or mates. Among the opponents have been members of Alaska’s congressional delegation, who say they are worried about the effects on the image and health of wild salmon. “This harebrained decision goes to show that our federal agencies are incapable of using common sense,” Representative Don Young, a Republican, said in a statement. The F.D.A. said on Thursday that there were multiple physical barriers in the Canada and Panama facilities to prevent any escape. The salmon are also made sterile to prevent reproduction in the event they do escape, although the sterilization technique is not foolproof. The F.D.A. regulates genetically engineered animals as veterinary drugs, using the argument that the gene inserted into the animal meets the definition of a drug. Critics have branded this an inadequate solution intended to squeeze a new technology into an old regulatory framework. They say the F.D.A. is not as qualified as other government agencies to do environmental assessments. The White House is now reviewing the entire framework for regulating genetically engineered products. The F.D.A. said that to approve the salmon, it determined that the fish was safe to eat, that the inserted genetic elements did not harm the fish itself, and that the company had adequately proved that the salmon grew faster. AquaBounty, which is based in Maynard, Mass., has long struggled to raise enough money to stay in business. It is now about 60 percent owned by Intrexon, a company started by the biotechnology entrepreneur Randal J. Kirk to pursue synthetic biology, a term for sophisticated genetic engineering. Intrexon has also acquired the company that developed a recently approved genetically modified apple resistant to browning and a British company working on genetically modified insects, such as mosquitoes that might be tested in the Florida Keys as a way to prevent dengue fever. Shares of Intrexon rose nearly 4 percent Thursday, closing at $36.65. A version of this article appears in print on November 20, 2015, on page A1 of the New York edition with the headline: Genetically Engineered Salmon Declared Ready for U.S. Plates .